This November, Austin voters will decide on one of the biggest expenditures in city history: a $1 billion proposal for a new starter light rail line and state road improvements. Austin Mayor Steve Adler’s transportation bond proposal totals $720 million. At times, the Mayor has said Austin needs to “go big” on mobility. But some transit activists are asking him to go bigger. Last night, KUT's Views & Brews partnered with the Austin Monitor at the Cactus Cafe to take a look at the past, present and future of transportation in Austin. From roads, to buses, round-a-bouts to rail, guest host Michael Kanin of the Austin Monitor spoke with some of the historians, policy makers and analysts in town, including the Director of the Center for Transportation Research at the University of Texas at Austin Dr. Chandra Bhat, political consultant Mark Littlefield, Greg Hartman of the Let’s Go Austin political action campaign supporting Proposition 1, Roger Cauvin of Austinites for Urban Rail Action, which opposes the plan. Could a New, Rail-Averse City Council Derail Prop 1? Austin voters are facing two major decisions this November. First, Austinites will elect a new city council from brand new geographic districts, and voters will also decide whether to borrow $600 million to build a light rail line. But, with so many City Hall hopefuls running on Prop 1-bashing stump speeches, what happens if voters approve the measure, and the next council has to implement policy they’ve sworn against? A major transportation plan took a significant step forward Thursday when the Austin City Council voted unanimously to put it on the November ballot. It’s a billion-dollar proposition. Voters would agree to a $600 million bond for a 9.5-mile urban rail line, contingent upon two conditions: matching funds from the Federal Transit Administration or another federal or state source, and a future city council securing $400 million dollars for road projects. The ordinance does not specify a source for the additional $400 million. The Austin City Council and the Capital Metro Board met today to learn more about a proposed urban rail route that needs approval from the council – and ultimately, Austin voters. There are still concerns about how to pay for the project. Project Connect is looking at adding rail, buses and other options to the transit system in Central Texas. But the project's proposed plan for downtown Austin is still contentious because it favors a route that would bring urban rail through East Riverside and up to Highland Mall at a cost of almost $1.4 billion. 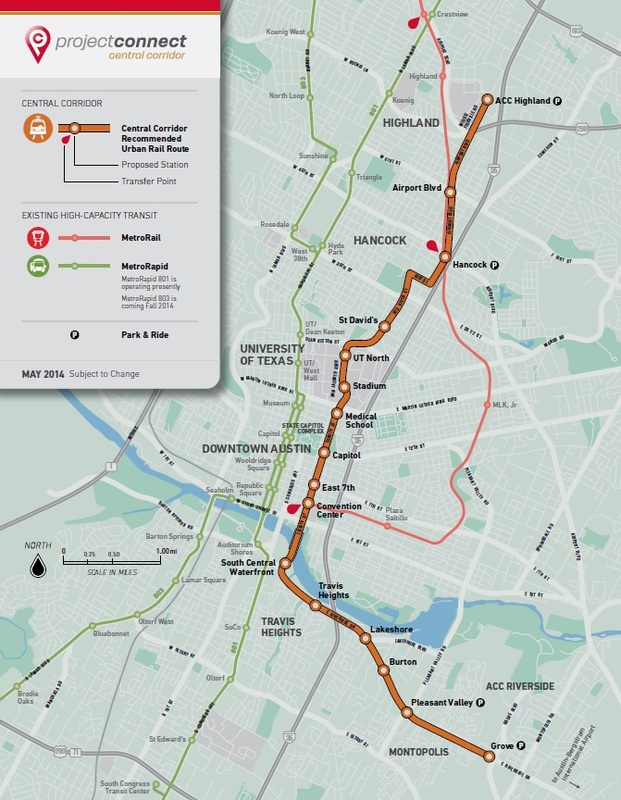 Map: Which Parts of Austin Should Get Urban Rail First? Now’s your chance to name the parts of Austin that should be served by urban rail. This week, the City of Austin and its transportation partners are inviting the public to name the subcorridor that would benefit the most from urban rail. Planners at Project Connect, the team coordinating the city’s rail and regional transportation efforts, have identified 10 subcorridors within central Austin. Not counting downtown’s core, they are (in clockwise order): Lamar, Highland, Mueller, MLK, East Austin, the East Riverside Corridor, South Congress, South Lamar, West Austin, and Mopac. Austin doesn’t have urban rail – but it’s already suffering from an identity crisis. That was one big takeaway from a presentation by urban planning experts on how Austin can get a rail project up and running. Austin is one of four U.S. cities chosen as part of an Urban Land Institute fellowship focusing on urban issues. The participating cities each chose a focus issue for a year-long study – and Austin chose rail. If you’ve ever wondered why a bus line stops at a certain place, or why some parts of town have more transportation options than others, this week Capital Metro has been having a series of open houses to answer those kinds of questions. Residents have shown a lot of interest in plans for urban rail. Urban rail is still in the planning stages. But the first phase is expected to go from the downtown Convention Center through the UT campus and on to the Mueller neighborhood.